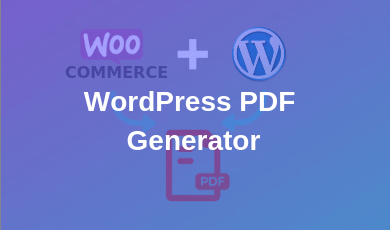 WordPress Pdf Generator allows your visitors to convert post, product, and pages into pdf and can print or send it to a registered email address. Custom post types- It supports custom post types and print into PDF. Custom meta fields- It supports custom meta fields and prints into PDF. Custom fonts- Feature to set Custom fonts for PDF. Header- You can include header logo to pdf, Option to show site name, site description, and site URL. Watermark- Add watermark text and images to look PDF wonderful. 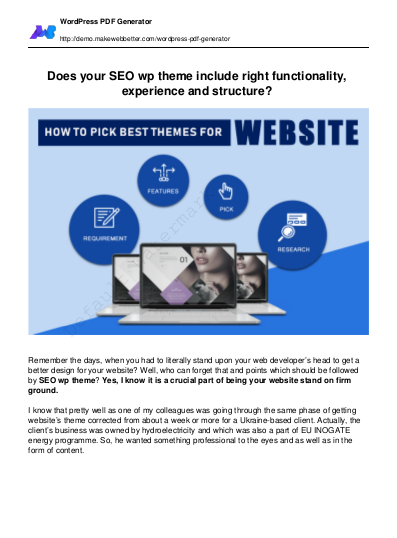 Different Font- Can customize fonts of header and content. Featured Image- Can select to display featured Images. File Name- Can set the filename for pdf. Default file name of the plugin is Post Id. PDF from Cache- Have the ability to generate pdf from cache to reduce load from the server and can schedule a backup of cache if Your blog is not updating too frequently and much more options. Custom CSS- Can add custom style to post contents, mostly all CSS supported. Email Mode- In email mode, each pdf export link generates a popup window and visitor have to enter an email address to which the created PDF will be sent. Cache supporting- It provides the functionality to deliver the cached PDF to decrease server memory usage if the cache is available in the system. Automatic installation is the easiest option as WP handles the file transfers itself and you don’t need to leave your web browser. 1. Download the zip folder of the plugin WordPress PDF Generator. Manual installation of the plugin is another option to install the plugin to your WP-environment. The manual installation method involves downloading our WordPress PDF Generator Extension and uploading it to your web server via your favorite FTP application. 1. 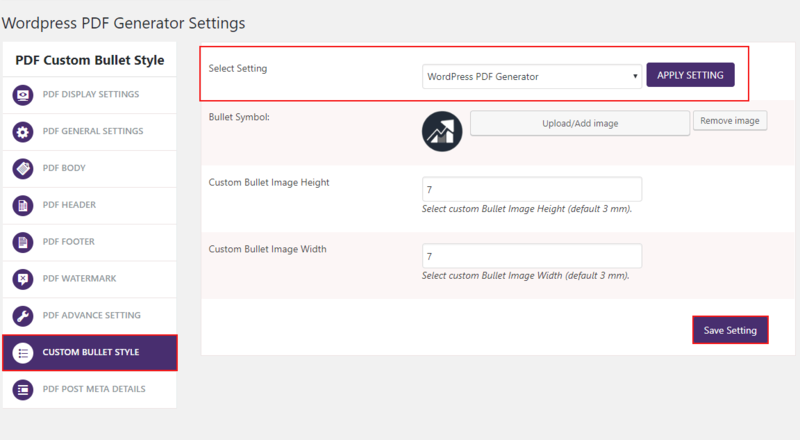 Upload the WordPress PDF Generator folder to the /wp-content/plugins/ directory. 2.  Activate the plugin through the ‘Plugins’ menu in WP. In this section, Admin can create multiple display setting for the pdf. 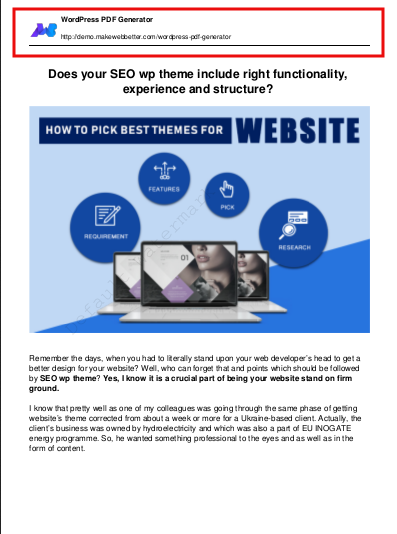 Click on the checkbox of Front End option to display pdf link on post and page in the front end. Click on the checkbox of Admin Panel to display a pdf link on the post and page in the admin panel. Select to show link button to Only for logged in users or For all visitors. Enable shortcode– If you enable shortcode then you will get the authority to apply shortcode anywhere in post content while adding or editing the post. Admin use these setting for display the PDF. Select Setting: First, select the desired setting that has created from the PDF Display Setting. Featured Image: Check Display featured image to display featured image below the title of the post. Include Cache: Select if you want to render PDF form Cache if available in Cache. Schedule Cache Updation: Select Duration for which you want Cache to be updated. By default, the cache will not be updated. Default File Name: The select file name of generating PDF (Post ID/ Post Slug). Display Author Detail: Select to include the author’s name in the PDF, and how it should be formatted. Display Post Category List: Check to display a list of the categories of the post. Display Post Tag List: Check this box if you want to display the Post Tag List on the pdf. Display Post Date: Check this box if you want to enables to display post release date. Button Alignment: Select Alignment of link button position. Button Placement: Select Place of the link button. Select Button: You can add your custom button. By default, a pdf icon is displayed for Post. In this setting give the layout of the PDF. Select Setting: Select the desired setting that has been created from the PDF Display Setting. 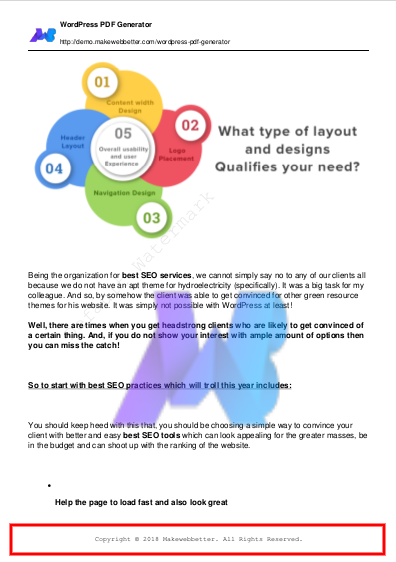 Template: Here, we provide 3 Default templates for Post and Products. The number of Product PostMeta: In this section, you can enter the number of post meta fields to be displayed along with the short description. 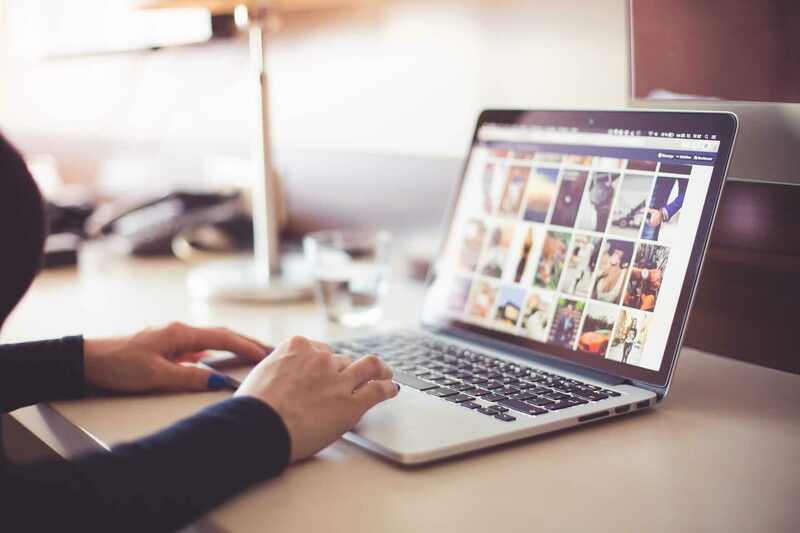 Image scaling Ratio: Select Image height and width with respect to original featured Image. Page Size: Select the needed page size (default is A4). Orientation: Select the desired page orientation (default is portrait). Unit of Measurement: Select the desired units of measurement (default is mm). Custom Title: Enter the custom title to replace with the post title. Custom CSS: Write here your own custom CSS for pdf pages. After changing the settings, the PDF will be shown as below. Right now we select template 1 for Post. When, we select template 2 for Post. When we select template 3 for Post. 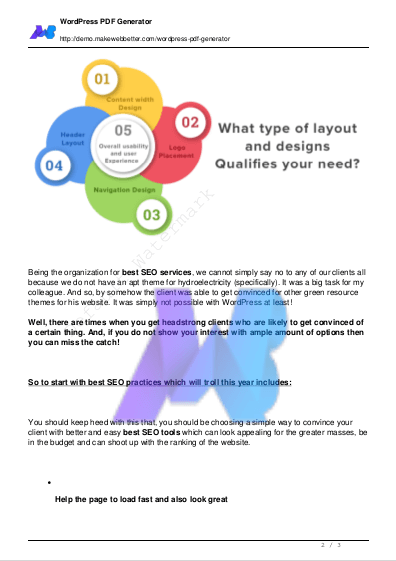 In this section, we design the header of the pdf. Page Header: Select to upload a header logo for your PDF doc. Logo Image Factor: This will apply to logo width/height to provide logo image some surrounding space. Logo Top Margin: Enter your desired top margin (default is 10 units). Header Font: Select header font to change the header content font for your PDF doc. Header Font Size: Select the header font size to change the header content font size for your PDF doc. Here we can see that the header of the PDF with logo. 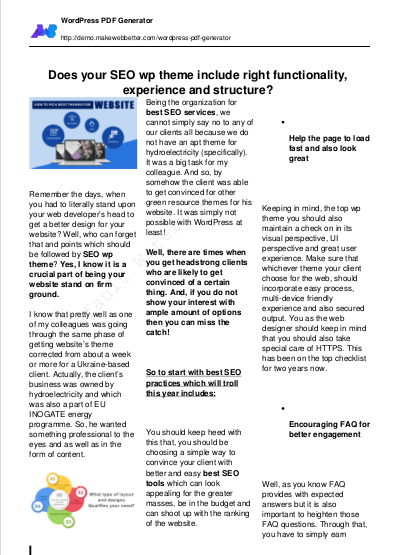 In this section, we design the Footer of the pdf. Select Setting: Select the required setting that has been created from the PDF Display Setting. Custom Footer Text: Tick the checkbox and write some text for the footer. Footer Font: Choose the font for the footer text. Footer Font Size: Select the font size for the footer. Footer Cell Width: Select required Footer Cell Width. Footer Minimum Hight: Select required Footer Cell Hight. Footer Cell Upper Left Corner (X): Select required Footer Cell Upper Left Corner. Footer Cell Auto-padding: Here you can select the auto padding for the footer. Here we can see the footer of the pdf. 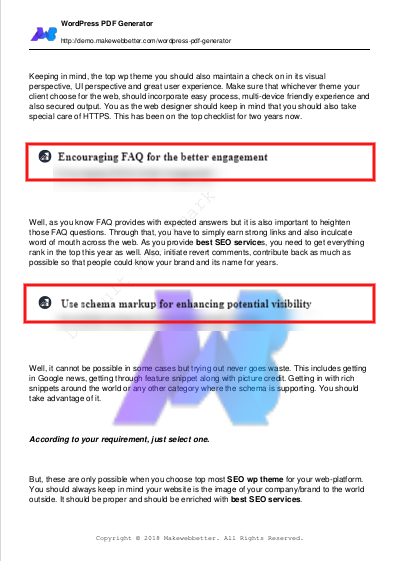 In this section, we provide all the options possible to add a watermark of the PDF like watermark text, Font of text, add an image of watermark, height & weight of watermark and set the transparency of the image. Here you can see the watermark image on the Pdf file. Browse to Select Your Font in the .ttf format: Browse a .ttf file, to upload it. TTF is a file extension for a font file, can easily be downloaded. 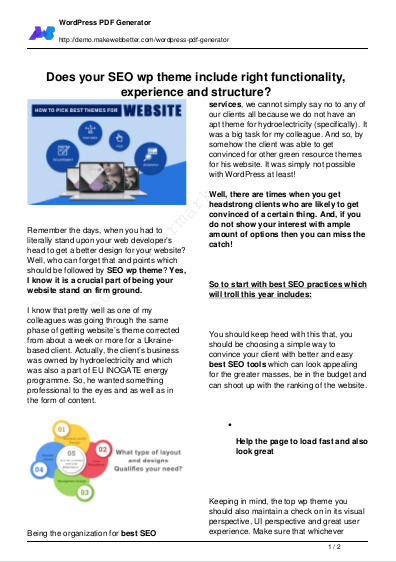 Set Page Rotation: Here you can rotate your PDF pages like 90 degrees, 180 degrees etc. Set Font Stretching: Enter the stretching size for the letters. Set FontSpacing: Enter the font space to set the desired space between letters to affect density in a line or block of text. In this section, we can add the bullet points to the PDF file and also set the size of the bullets. Here we can see the bullets points of the PDF. Select Post type for which You want to export PDF. It also allows the post, page, and products meta fields to be listed in the tab and they can display in the PDF. Goto the edit screen to download Pdf of post/product/page for any product. Here admin can download PDF by clicking on Exportpdf link. To generate PDF in bulk select Export option from the drop-down and click on Apply link. Click on OK to save the pdf.